Our ‘unconsciously insular’ President, Barack Obama, on Saturday slammed Wall Street’s “audacity” for fighting a bailout fee he wants to slap on financial firms and said his Republican opponents had sided with big banks (here). While Washington, DC has done an excellent job in growing the National Debt, Wall Street has been busy actually creating wealth and opportunities for millions of Americans. In comparing the total loss produced by the Federal government, to the total return ‘earned’ by investing in the S&P 500, from 1950 through 2009, I’ll go with Wall Street. While Washington, DC netted a total loss of -403.85% for taxpayers over the period, Wall Street produced a total return for investors of +760.15%. This is not rocket science. Thanks but no thanks Mr. Obama. 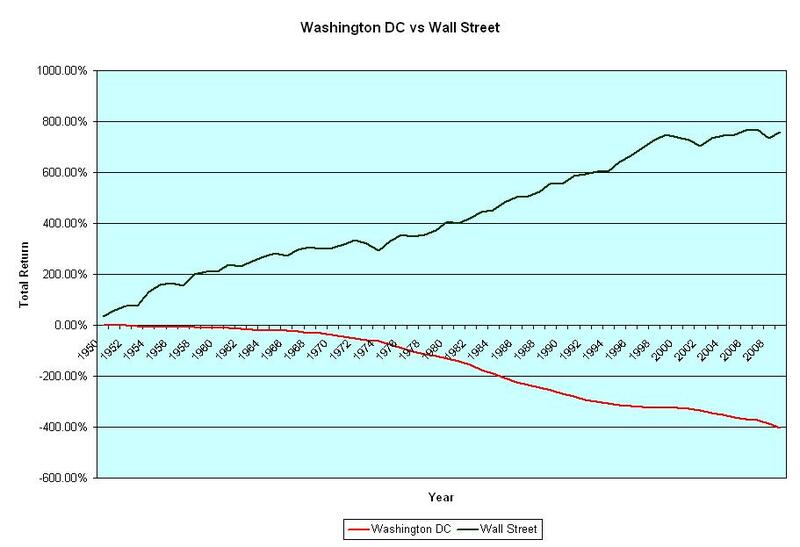 Wall Street outperformed Washington, DC by 1,164.0% over the last 59 years. While Obama seeks to win political brownie points, in the real world his warped ideals don’t pass the logic test. I would suggest to Mr. Obama, that he concentrate on figuring out how to shrink the size of the Federal government’s budget and the national debt, and keep his nose out of the private sector. Clearly Obama has no future in the world of finance. Perhaps when he retires, which will be in just a couple of years, he could entitle his next book, “The Audacity of Irresponsibility”. For a binary solution needed to restore free markets, private property and limited government, why not focus on getting political leaders to pass a Capital Homestead Act by 2012, the 150th anniversary of Lincoln's Homestead Act? For a summary of the basic money, credit and tax features of such an omnibus piece of legislation, see http://www.cesj.org/homestead/summary-cha.htm. Will do Norm, but first we have to cast down this insidious idea that a socialist (anti-free market) system is better, lest there be no free market left with which to institute Capital Homesteading. It is clear from the policies being implemented by the current administration, that Mr. Obama will not be our ally, so we must work to defeat his anti-free market ideals in the 2010 and 2012 elections. One brick at a time. I'm doing what I can to promote Capital Homesteading, but it's hard to get through to people who are engaged in trying to preserve what's left of the free market.